Weapons 9 and Dead Serious Promotions will return to Schuetzen Park in North Bergen, NJ on September 7th with The Warriors Cup XVIII. 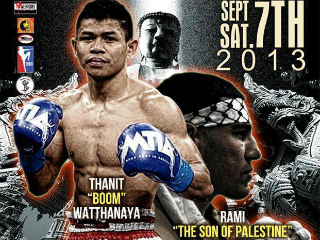 The event will be headlined by a bout between Thanit Watthanaya and Rami Ibrahim. The pair was previously expected to fight under the Take-On Productions banner in 2011 but and injury forced Watthanaya to withdraw from the bout. Watthanaya will be moving up to 130lbs to fight Ibrahim for a WBC international title. He has won his last two fights including a back and forth slug fest with Andy Howson and Muay Thai in America: In Honor of the King to end 2012. Ibrahim will be looking to snap a two fight skid when he steps in two fight Watthanaya. Ibrahim has been scheduled to fight at least three times this year but each time the bout has fallen through. An announcement regarding the remainder of the pro card for the event is expected soon from The Warriors Cup.